Published by the Secretariat of the Convention on Biodiversity in 2004, this document offers voluntary guidelines for the conduct of cultural, environmental and social impact assessments regarding developments proposed to take place on, or which are likely to impact, sacred sites and/or lands and waters traditionally occupied or used by indigenous and local communities. The title is a Mohawk term meaning “everything in creation,” emphasizing the guidelines’ holistic nature. Recognizing the contribution that traditional knowledge can make to both the conservation and the sustainable use of biological diversity, these guidelines are intended to be a tool toward achieving significant reduction in the current global rate of biodiversity loss. In 2002, the National Congress of American Indians passed this resolution, defining the criteria by which it would assess proposed U.S. public policy regarding the protection of Native American sacred places. The tribal peoples’ rights organization Survival International created this code of practice for filmmakers working with tribal peoples in 2011, in response to a tribal TV series that aired on the Travel Channel, which presented a “staged, false, fabricated and distorted” depiction of the Matsigenka tribe of the Amazon. The guidelines aim to prevent further misrepresentations and potentially damaging portrayals of tribes. The International Society of Ethnobotany Code of Ethics, published in 2006 with additions in 2008, provides a framework for decision-making and conduct for ethnobiological research and related activities. It affirms a commitment to work collaboratively, in ways that support community-driven development of indigenous peoples’ cultures and languages, acknowledge indigenous cultural and intellectual property rights, and protect the links between cultural, linguistic and biological diversity. The ISE is in the process of developing an Ethics Toolkit to assist in the practical application of the code. This visionary Cultural Use Plan was prepared by the Edith Kanaʻole Foundation and released by the Kahaʻolawe Island Reserve Commission in 2009. Although crafted for Hawaii’s unique culture, history and environment, it is a blueprint for a community of wise, committed individuals to heal and restore a sacred place. 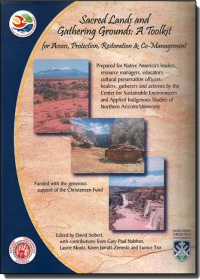 Published by Northern Arizona University’s Center for Sustainable Environments and Applied Indigenous Studies in 2005, this document includes tools to gain access to, protect, co-manage and restore sacred sites, with a focus on Native American sacred lands in the United States. Section I contains legal doctrines, laws and U.S. federal agency policies applicable to protecting sacred lands. Section II summarizes how various federal agency policies affect sacred lands and gathering grounds and issues of access for native peoples to those areas. Section III offers tools for collaboration and co-management, including information on consultation between tribal nations and federal agencies. Section IV explores the philosophical values underlying cultural connection to sacred places and features perspectives of various religious organizations to promote the sanctity of creation and responsibility of people of all faiths to be stewards of sacred lands. A section on “Communicating the Sacred” includes case studies with lessons learned and explores messaging and language in campaigns to protect sacred lands. From 2006 to 2008, Sacred Land Film Project Director Christopher McLeod, along with colleague Rob Wild, International Union for Conservation of Nature (IUCN) and UNESCO published Best Practices Vol. 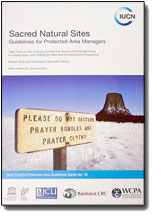 16, Sacred Natural Sites: Guidelines for Protected Area Managers, and launched the publication at the World Conservation Congress in Barcelona, Spain. A Sacred Site Custodians’ Dialogue was held in Barcelona prior to the release of the guidelines and the Custodians present drafted and issued a statement about protecting sacred sites. Produced as part of the Association on American Indian Affairs‘ Native Sacred Places Protection Legal Workshop, these materials summarize the laws and processes relevant to the protection of sacred places, including historic preservation, environmental laws and federal agency planning processes. The goal of the workshop is to empower tribal nations to effectively advocate for the protection of sacred lands by providing their leaders, staff and citizens with information about the legal tools available to protect these sites and practical advice about how they might best be used.